While Christmas & New Year booking periods may be a minimum stay of 10 days! Our house offers an exclusive vacation home. 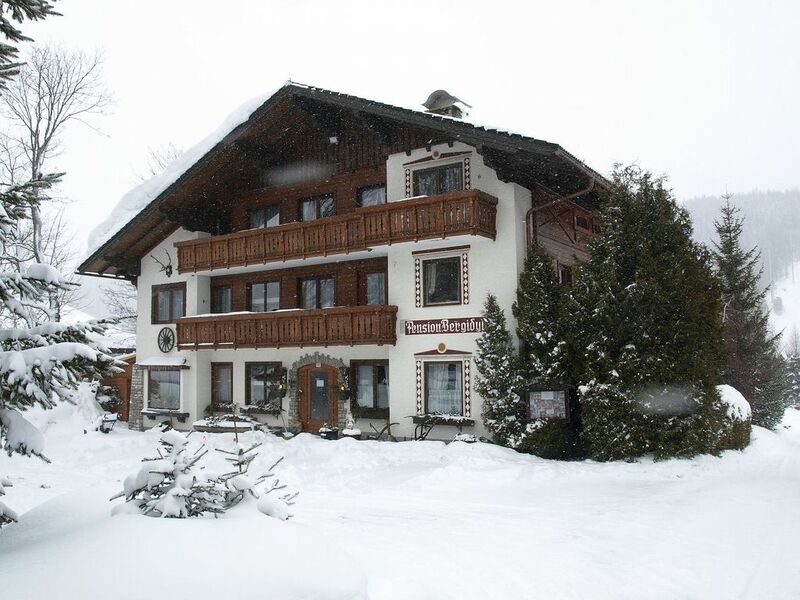 Our house Bergidyll**** is situated in the center of Ramsau am Dachstein, although it is in the most quiet place because you will find us in a dead-end street. Enjoy this beautiful view to the mountains, from our cute vacation home. Choose your favorite comfort: Sauna, steam-bath or just shower-bath. The vacation home offers an electric tiled stove in the living room. The kitchen is featuring electrical oven & stove, dish washer, coffee machine, fridge, microwave. In the vacation home you have more than one television device. You will find even and DVD-player. Visit us in Styria, Ramsau am Dachstein! Make Your vacation to an unforgettable time of recreation and stay with us in the center of the most picturesque mountain scene in Austria! Stay with us at Bergidyll****! Our aim is your unforgettable holiday! In the heart of our mountains-House Bergidyll****: At Bergidyll**** you find YOUR absolutely amazing and cosy vacation home for relaxing and recreation. If you look for an apartment with exclusive furniture & mountain view or you look for bed & breakfast, we are your vacation home house in a very quiet place with all comfort you will need! Visit us in that picturesque mountain and natur-scene, at Bergidyll****! The bathroom offers a bath-tub as well shower, hair dryer and toilet. Our vacation home offers living room with electrical tilted stove, lounge and dining table, television, W-LAN, telephon and kitchen, which is equipped with electrical stoven & oven, dishwasher, fridge, microwave, coffeemashine. The apartment offers a balcony with absolutely amazing views. The sleeping room offers as well television and telephon & balcony. The bath provides shower and bath tube, the home is equipped with its own sauna. Apartment was as described, neat and clean, very nice, very quiet and well equipped, view over the balcony and terrace is very beautiful, overlooking the mountains, Dachstein is absolutely breathtaking and the gorgeous village. Apartment ideally located for hiking with clearly marked trails, walking, cross-country skiing etc. The cross-country tracks are right around the apartment house. It was absolutely nicely to have such a large sauna for private use! It is a must to rent this apartment!!! We had a lovely stay. We highly recommend this apartment. We are very pleased. Many thanks!